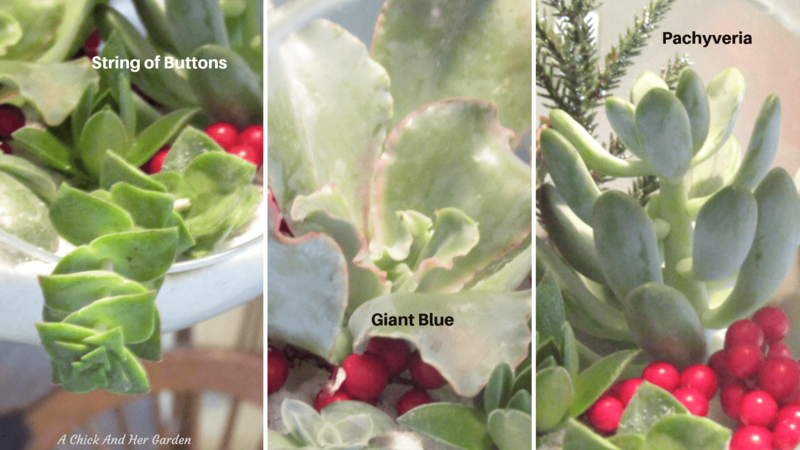 Winter is just around the corner, and it’s time to start planning out how to create holiday succulent decorations! I know, I know! We’re still cleaning up fall flower beds and I swear I was just playing in the gardens! But, these cold days come on quick and it’s one of the reasons I love growing succulents most! They help me keep my hands dirty when I can’t get outside in the vegetable garden or cutting garden. And they are living craft projects! Recently I got a new shipment of cuttings from Mountain Crest Gardens and I had to find new ways to play with them! Browsing around at the craft store I found a terrarium on sale (plus a coupon!) that was shaped like a bulb that had a a loop on the top to hang from. Looking for a centerpiece, perfect for the holidays? Check out my Rustic Succulent Centerpiece here! Immediately I saw a Christmas snow globe! Yeah I know, tender succulents will die in the snow. And they definitely won’t make it submerged in water, but that doesn’t mean we can’t make them look like they’re growing in the snow! 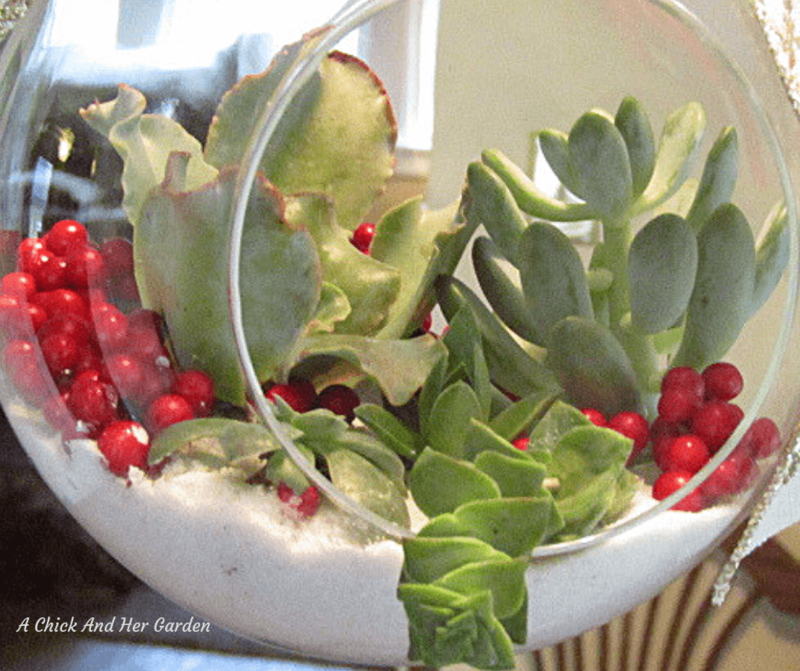 What will you need to make your own Holiday Succulent Terrarium? To start, you need succulents of course! You can use potted succulents, but you’ll actually be creating a lot of work for yourself! I highly recommend cuttings for this project! If you don’t have succulents, or not enough, this pack of succulent cuttings from Mountain Crest Gardens is perfect! Use what you like for this project, start another project with the rest, or pop them into some pots with potting soil and let them root for later! My last order came with an awesome variety, perfect for projects like this! There were String of Buttons, Giant Blue, Afterglow to name a few. Here are some close ups of the cuttings I used. If you’re starting with rooted succulents, remove them from their pots or planters and completely rinse off the root system. You won’t want soil mixing in with your snow white sand! Next, fill the base of your terrarium with white sand. Push your succulent stems into the sand. This is another reason why cuttings are easier than rooted plants. They will just poke into the sand, whereas with rooted plants you will need to dig holes, and bury the root system. With the cutting stems you just poke them in. It also makes it easier for rearranging the plants to what works best for you. Once you have your plants arranged, if you need to, add a bit more sand around the terrarium. A spoon works great for this. Now, cut bunches of berries from your floral berries and add them around the succulents. You can also find some really fun miniature garden figurines that are Christmas themed, like this Christmas Tree, and pop them in there too! The terrarium should have a flat bottom so you can either set it on a flat surface, or use the twine and ribbon to make it hang! Measure out your twine to twice the length that you need. Fold it in half and loop it through the loop on the top of the terrarium. If you’d like to add a bow to the top, here’s a link with 25 ways to create a bow. After I made my bow, I made to slits in the back of the bow with scissors, and fed the twine through them! Viola! 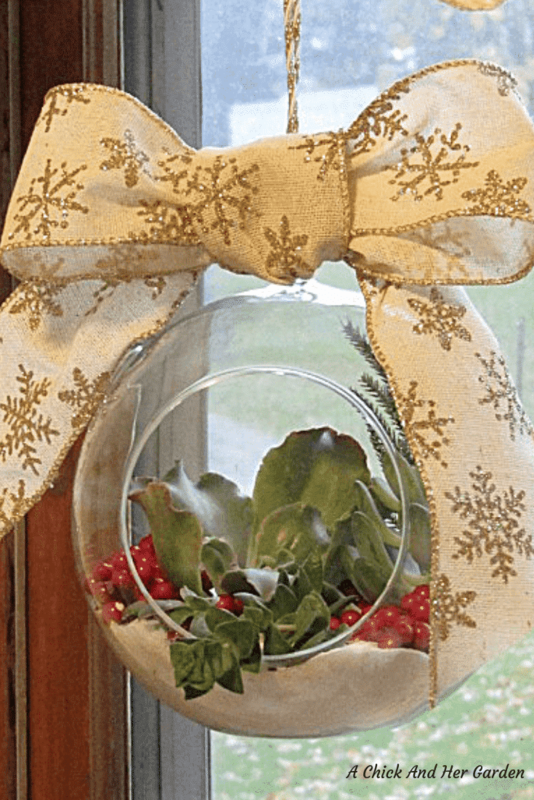 Holiday Succulent Terrarium! To care for your succulents, place (or hang) your terrarium near a sunny window, and water about every two weeks. If they seem droopy they may be thirsty. But if your leaves seem to start dying, you’ve probably over-watered and you can cut it back. Here’s some more tips on succulents and caring for them.